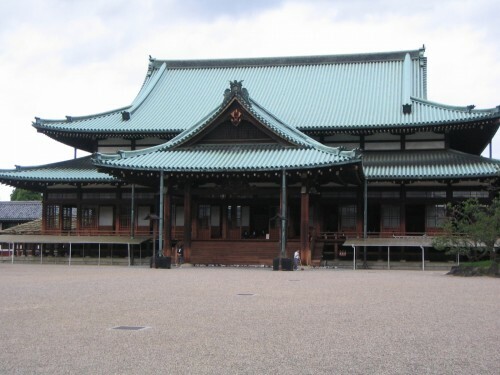 Oyasama‘s 213th birthday was celebrated at Tenrikyo Church Headquarters today. Happy Birthday, Oyasama! Did you know… that the first time Oyasama’s birthday was officially celebrated was on April 18, 1934? In addition to holding the Kagura Service, celebrations currently include a chorus performance in front of the Foundress’ Sanctuary. We at Tenrikyo Resource would also like to use this occasion to announce that the The Life of Oyasama, Oyasama’s official biography, is now online on the TR wiki. Also, just to let everyone know, the wiki is a work in progress. We would like to encourage anyone who is willing to write pages or proofread for the wiki to go ahead and create an account. 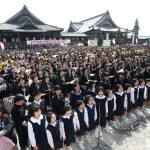 4/21/2011 Update: The Doyusha website has posted a video relating to this year’s Oyasama Birth Celebration Service. Although the video is only in Japanese, it may be noteworthy to mention that there is a shot of followers holding banners that read “仙台” (Sendai), which suggest they are pilgrims belonging to the grand church of the same name.